The European Central Bank is expected to end emergency lending to Greece's banks on Sunday, the BBC understands. Well-placed sources told BBC economics editor Robert Peston a decision to end the Emergency Liquidity Assistance (ELA) would be made by the ECB's governing council later on Sunday. Greek banks depend on ELA funds daily. Greek Finance Minister Yanis Varoufakis said his government would consider overnight what measures to take "to minimise the burden on our people". Cutting the ECB lifeline could push Greece out of the euro. Such an ECB cut would mean "Europe has failed", Mr Varoufakis told the BBC's World this Weekend. It would mean Europe had "failed in its duty to preserve in parallel a democratic process and a monetary union", he said. "It is a dark hour for Europe." The lenders have "not met Greece even a quarter of the way", he complained. The government would consider "what can be done to minimise the burden on our people from Europe's refusal to grant us democratic rights". 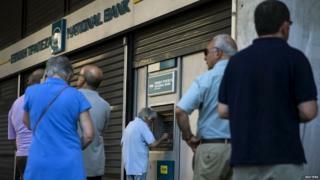 A BBC reporter in Athens says long queues are forming at bank ATMs. The EU-IMF bailout for heavily indebted Greece expires on Tuesday and talks have broken down. Greek banks would find themselves in serious straits as soon as Monday if the ECB cut the ELA funding, Robert Peston says. Greece will probably have to announce a bank holiday on Monday, pending the introduction of capital controls, he says. It is one of the most momentous decisions the ECB has ever faced, since the euro was launched on 1 January 1999. French Prime Minister Manuel Valls said the ECB "is independent but... I don't think it can cut off rations [for the Greeks]". He said "it's the Greek nation that is suffering". Capital controls are restrictions on how much customers can withdraw from banks. Until now, the Greek government has signalled that it does not want to impose such controls. In recent weeks, Greeks have withdrawn billions of euros from banks. A Greek withdrawal from the euro - known as "Grexit" - is not inevitable, says Robert Peston, as the eurozone did resolve Cyprus's banking crisis in 2013 and the country stayed in the euro. Capital controls were imposed on Cypriot banks, and remained in place for a long time - the last restrictions were only lifted in April this year. Greece's situation is more difficult, our editor reports. Capital controls are seen as an important step towards leaving the euro, because the single currency's rules require free movement of capital. But Greece could remain in if its government and the bailout providers - the EU and IMF - can restart constructive negotiations, he reports. It is the most important decision in the ECB's history. A withdrawal of funding could plunge Greece into chaos and yet the ECB cannot break its own rules by funding a banking system where the country is heading for a default. Alexis Tsipras has gambled both with his future and that of his country. He committed Greece to a vote, but only after the current bailout has expired, so leaving Greece vulnerable and exposed. Read Gavin's analysis in full here. What are the Greek papers saying? On Saturday eurozone finance ministers - the Eurogroup - refused to extend Greece's desperately-needed bailout beyond Tuesday. The ministers blamed Greek Prime Minister Alexis Tsipras's surprise call for a referendum on 5 July on the bailout conditions. The final €7.2bn (£5bn; $8bn) of Greece's second bailout has been frozen since last summer, as lenders demanded more Greek progress on deep economic reform. Without more lending to Greece the country will default on a €1.6bn repayment due to the IMF on Tuesday. Under the rules governing the euro, the ECB's emergency lifeline could not be continued if the ECB considered Greek banks to be insolvent. Robert Peston says that with Greece no longer participating in a formal rescue programme, the solvency of the Greek state would be in doubt, as it is so intimately linked to the banks' solvency. Mr Tsipras's leftist Syriza government rejects the bailout terms, after five years of lender-imposed austerity that has increased Greek unemployment and cut pensions and welfare benefits. Greece has endured five years of recession, and total output (GDP) has shrunk by 25%.